The Civic is probably the most successful and important model in Honda's range. Sales already exceeded the 1 millionth mark more than 5 years ago and with each succeeding generation, Honda steadily improved the design. The last generation, the EK-Civics were especially significant in that it became the first Japanese mid-range car which is widely regarded as being able to compete, an a par, with the continental competitors in terms of ride quality, safety, and handling - areas where Japanese cars have traditionally faltered in. In the engine compartment, while DOHC engines have been the flag-bearer for the Honda Civic, SOHC engines has also always featured as the mainstay of the 'lower' more sedate models, those which are targeted at the executive and family segment. 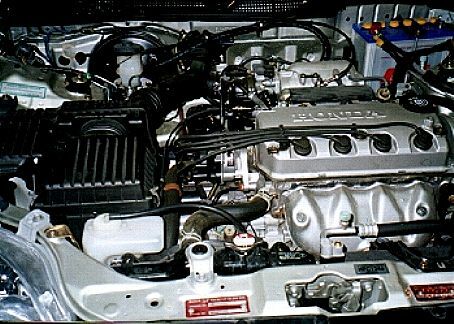 Thus, the 1.5SOHC and 1.6SOHC engines have thus always been in use in one form or another throughout the generations, and the 1.6SOHC engine especially carries the powerplant duties for the official 'approved' top of the range Civic in many export markets, right up until the previous EK generation Civics. In absolute terms, the 1.6SOHC engine has acceptable specs. From 1590cc, SOHC and PGM-Fi, the 'plain' version generates 120ps. Adding VTEC gains ~5 ps in max power while also improving the overall power band. In fact for some ASEAN markets, equivalent competitions, even DOHC versions frequently generate lower power. The SOHC configuration allows a more compact engine and is simpler in design as well. Being targeted at the executive and for family-use, 1.6l SOHC Civics are most popularly sold with automatic transmissions, the superior ease of drive being greatly desirable for relaxed highway cruising as well as for dealing with congested city traffic conditions. 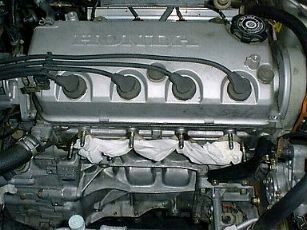 But the 1.6SOHC first debuted in the 1980s, with the SOHC-VTEC version in the early-90s. Therefore in reality the engine has remained relatively unchanged, while each generation saw great leaps of improvement in all other areas. Because of this, later generation Civics especially the 1.6SOHC EK export versions effectively lacks an engine that is commensurate with the rest of the car. The automatic versions especially drives sluggishly; the car lacks enough power to handle itself respectively on the roads and even more so on the highways. The midrange pull is especially anaemic and trying to pick up speed from regular cruising speeds are frustratingly slow while over-taking can even become hairy affairs. As an overall package, the 1.6SOHC Civics really cries out for a more capable engine. It is in view of this shortcoming of the 1.6SOHC that Aerotech embarked on a project to design a special HKS turbo-kit for the 1.6l SOHC engine early last year. The primary objective of the project was for a purely bolt-on kit, specifically set-up for street-use. The kit was designed to fit both the non-VTEC and the VTEC versions. The intention is to upgrade the power of the 1.6SOHC, to put it at a level more commensurate with the overall quality of the car, so that it is now able to handle itself ably against the equivalent competitions. 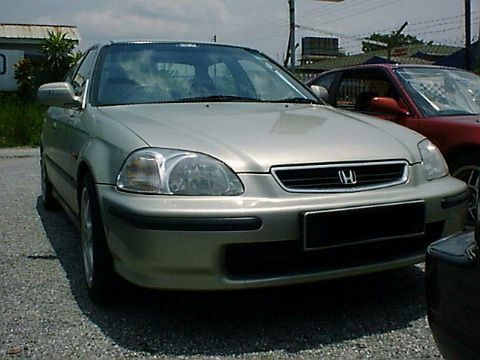 The original kit was prototyped on a Malaysian market Civic VTi, a 1.6SOHC VTEC but the first production kit was installed on an Aerotech owned automatic 1.6SOHC Civic EXi. This uses the non-VTEC 120ps engine and represents the configuration that is pre-dominantly sold in most ASEAN market for which the 1.6SOHC Civic forms the official top Civic model. I was fortunate to watch the design, installation, and final tuning of this 'demo' Civic. At this time of writing, the demo-Civic has already been used for more than a year. As stated, the advantage of this kit is that it is a complete bolt-on. Though fitting the kit will involve a large amount of work, nothing inside the engine is touched. Essentially it becomes an extension of the popular filter/exhaust/air-fuel tuning package. Installation work starts with dismantling the header (until just before the catalytic converter) and the intake system (piping, air-filter, box). After this, work on putting the kit starts immediately ! The photo taken on the right is the engine just before work is started on the turbo-kit. 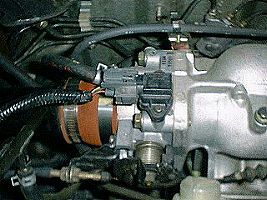 The heart of the turbo-kit is a Mitsubishi TD04 turbocharger. This deceptively smallish looking turbocharger is specially selected to complement the engine. The turbocharger has a low inertia which allows it to spool up very fast. The design objective for street-use focuses specifically on quick throttle response and a broad seamless power band. 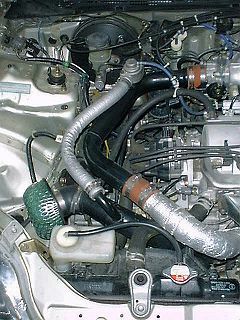 The kit's piping was designed based on existing HKS turbo-kits for other cars and fabricated locally. 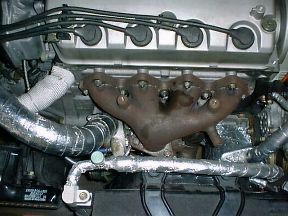 The exhaust manifold especially received special attention. 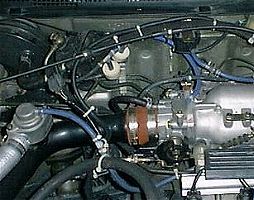 The design of the manifold can affect the spool-up efficiency of the turbo-charger. Using the manifold supplied with the HKS Turbo-kit for B16A/B18C as a base, a manifold was specially designed for this kit. Because of the heat and high pressures involved, manifolds that are made from welding separate sections together often end up with leaks. To avoid this, the final manifold design was cast, the task being subcontracted to a local factory. A blow-off valve is included as an integral part of the base kit. The one selected for the kit, and installed in the demo-car is mounted on the pressure pipe and discharges the excessive pressure into the air-filter pipe. Another important component for reliability and durability is the oil-cooler. Though the base kit does not include an oil-cooler, it was decided that one be installed on the demo-car. 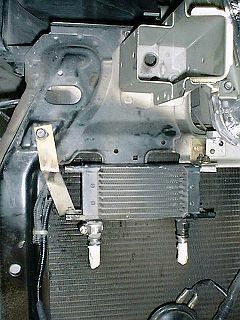 The oil-cooler kit on the demo-car is an European kit. The turbo-kit is designed to work well with both stock and aftermarket exhausts. The demo-car retained its stock exhaust. Another important element to highlight is the retention of the stock catalytic converter ! Unlike N.A. tuning, turbocharging can benefit from the use of a cat. The extra restriction of the cat allows pressure to build up faster in the turbine and this helps in spool-up time and directly to better low-end and mid-range power in return for a slightly degraded max power. Above all however is the decision that power does not always means harm to the environment and the cat of course ensures low emissions as well as lowers excessive exhaust noise. Though the turbo-kit will work with the stock air-filter system, for max air-flow efficiency the HKS Super-Power-Flow is used. Again the pipe connecting the mushroom filter to the compressor had been specially designed to position the filter into the location originally occupied by the stock filter box. With a turbocharger, the rowdy characteristic of the open element filter is very much tamed, the compressor serving as a form of noise damper that helps reduce intake roar by as much as half. The mechanical components of the kit are now mostly completed but the other critical portion of the kit needs to be taken care of, and that is the fuel management. Recent generation Civics, irregardless of their engine, have the MAP sensor mounted directly on top of the throttle body. So to facilitate installation of the check valves, the MAP sensor has to be relocated to a remote location and connected to the throttle body using a good quality vacuum hose. The original mounting port on the throttle body is closed by a custom designed blank plate with connection for the vacuum hose complete with the necessary check valves, two of them, for assured reliability. For the demo-car, fuel management is taken care of by a HKS FCON-4 computer. This piggy backs on top of the stock ECU through a custom designed wiring harness. The stock ECU bears the P6E code, a relatively rare model in Honda's line-up, probably mainly for the ASEAN market. The FCON-4 allows custom fuel mapping. The car has just one meter installed for monitoring functions, a small HKS Boost meter sits on the center console. I've ample experience with Aerotech's works and know very well that their modification projects always looks at the car as a whole package. This being their HKS demo turbo Civic, things are no different. The first thing that received attention other than the engine were the braking system. The front disc was changed for a pair of PowerSlot used with stock Honda brake-pads. The brake hoses were changed to steel-braided Teflon hoses and HKS Super-DOT4 Racing was used for the fluid. The stock 14" rims and tyres were changed for a set of 16" Enkei used with 205/45 HR16 Yokohama A539 tyres. The suspension received a set of HKS Hiper Dampers in order to ensure optimum handling with minimal sacrifices in comfort. The final element was the transmission fluid. HKS Super ATF were used which gives superior response from the automatic gearbox. With the kit installed, one may think the bulk of the work has been done. But the truth is the real work has only just begin ! Proper tuning is extremely important for a turbo-charged application. I witnessed most of the tuning work, learning a lot from it. The first task that is needed is to set the working boost for the turbocharger. A boost meter is mounted to the engine and the working boost level was tested and finally set to 0.3 bar. One problem I learned about a turbo-charged automatic is that when the transmission shift gears, the resulting jolt when the next gear engages at full throttle (known as 'shift shock') will cause a spike in the boost level. The working boost level is controlled by setting the actuator waste-gate (actually by setting the pre-tension of the actuator spring). The problem is that if we set the waste-gate for 0.3bar boost under stable running conditions, the shift-shock boost goes to 0.6bar or higher. This caused a lot of headache as the engine could be heard to detonate and that is very detrimental to its health. The final solution was to use a HKS Relief Valve. This valve works similarly to the blow-off valve and its function is to firmly limit the working boost level to 0.3bar, even during shift-shocks. Tuning work now settles down to the tedious and difficult task of calibrating the fuel map. 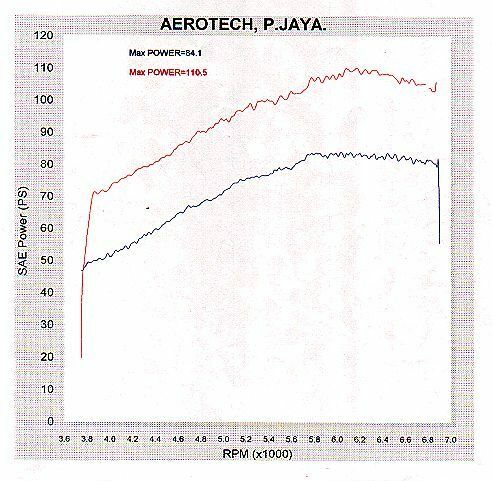 This is tuned through a very intensive dyno session (on Aerotech's Dynojet) over the best part of the next two weeks. Fuel mapping is crucial to ensure optimum air-fuel mixtures. Ignition timing was tuned via setting the base distributor timing since the FCON-4 does not provide ignition timing tuning. The Dynojet chart on the left shows the final result of the HKS Turbo-Charged 1.6SOHC Civic, plotted together with the baseline reference power chart for comparison. The baseline was done on the car just before the turbo-kit was installed. With an automatic transmission, we have seen that losses are a high 30% from engine power. From 120ps, this 30% loss works out to 84ps at the wheels. The baseline reference for this Civic was 84ps, spot-on the theoretical value ! The max-power for the turbo-charged version on the other hand, topped out at almost 111ps. The HKS turbo-kit upgrades the power of the 1.6SOHC to slightly higher than that of an automatic B16A ! Note that the new power curve is an almost exact replica of the stock curve but brought up more than 26ps higher in the comparison chart. The low-inertia property of the turbocharger allows it to spool up very quickly. This gives maximized power gains across practically the engine's entire operating rpm range. Starting from as low as around 3000rpm, power gain already exceeds 20ps, and this is sustained consistently right until the engine's red-line rpm (~6800rpm). If we were to compare against the reference power curve of a stock automatic B16A, we will see that the turbocharged 1.6SOHC generates more power across all RPMs. At 4000rpm, the turbocharged unit exceeds 70ps while the B16A struggles to achieve 60ps. Even after VTEC has opened the wild cams at 6000rpm, the B16A still failed to equal the turbocharged 1.6SOHC. A jump from 84ps to 111ps at the wheels translates to a 27ps gain. The works out to a relatively big 32% gain in power, at the wheels. Working back to engine power, using the now proven 30% transmission/accessories loss formula gives us a figure of almost 160ps power at the engine flywheel, a 39ps gain from stock ! For evaluation of absolute power gains in total isolation (ignoring the significant benefits of throttle response and overall cost), it is important to highlight that this has been achieved with the stock exhaust system and the stock cat still intact and without an intercooler. I was one of the first to test-drive the final completed car. The power set-up of the demo-Civic focuses on good throttle response, with a strong, broad and seamless power-band. Good throttle response minimizes the time between pressing the throttle to when the car surges forward. A strong power band is essential to impart confident and safe overtaking maneuvers or when there is a need to merge into fast flowing traffic. Generous power must be available from low down in the rpm band and maintained right up to the red-line. But the power delivery must also be seamless. Relaxed confident driving comes from a smooth delivery. Sudden rush of power associated when a big turbocharger spools up will lead to a sudden mad rush forward, not something conducive to relaxed driving and may certainly catch out the family driver unused to such a characteristic. This Civic's power delivery is strong but deceptive - the car easily reaching speeds of 160-170kph without any drama or strain. The power of the turbo-charged engine now matches that of an equivalent spec'ed 2.0l or even 2.2l version ! Above all, this kind of confident power has been packaged with reliability and fuss-free maintenance. No need for special octane booster for the petrol, and no special maintenance procedures required other than a slightly shorter oil change interval. The usability of the car remains intact - full interior with a high quality of comfort and ride. This is the specific design objectives of this HKS demo-Civic, targeted to meet the specific requirements of the owner who has chosen an automatic 1.6SOHC Civic. Due to circumstances which developed, I had the opportunity to have exclusive use of the car for 4 days a few months after the project was completed. I had to work on-site at a remote customer's location, a round trip of close to 100km from the office. Most of the journey involves travelling along the North-South Highway, actually a 3-lane expressway. This portion of the highway has a speed-limit of 90kph (~55mph) and since the car is not mine, I obeyed this limit over most of the trips. Nevertheless, I for one will admit to failing to be the complete angel, so there were a few occasions where I succumbed to the temptation to try out the true power of the car. On one such occasion, I engaged on a 'chase' of a Peugeot 406 SRi. It was more out of spite than anything else since I had originally wanted to switch into the fast lane to overtake a slow moving vehicle in front of me but the Peugeot pop out of nowhere and flew past at high speed, giving me quite a startle. The Peugeot 406 SRi uses a 2.0l SOHC EFi engine. I wanted to see how the turbo-charged 1.6SOHC will fare against something 400cc or 25% larger in size. I thought that this will be the kind of 'competition' typical of those an owner of a 1.6SOHC will get creamed by. Shifting into D3, kickdown made the auto shift down to 3rd gear and I started the chase. The Peugeot had built up a lead of about 50metre at that time but with the turbocharger at full song, I was right up its tail within a very short time. Thereafter I played a brief tail-gating game, not only easily keeping up whenever the Peugeot accelerated when the road ahead opens up for him, indeed had I kept the foot down, overtaking the accelerating Peugeot would have been a simple matter ! In the end, I believe the claim to be justified when Aerotech told me the turbo-kit made the 1.6SOHC behaved like a 2.2SOHC. During those 4 days, I was easily able to toy around with 1.8l and 2.0l SOHCs easily and though I didn't 'try' things with a 2.2l SOHC like an Accord or Camry, I had no doubt the HKS Civic would've been able to keep up with them. I am very impressed by this HKS Civic project. I had also wanted to wait more than a year before doing this feature on it for one very good reason. The other common misconception of a turbo-charged Honda is that they are unreliable and will break down quickly. But at this moment in time, the HKS demo-Civic has already been running for almost a year and a half, which involves daily city use and expressway driving, including several trips to and from Singapore - a journey exceeding 300km each way. The car to my knowledge had only needed the normal service routines and replacement of standard wearable parts. This better than any words speaks well for the car's reliability. 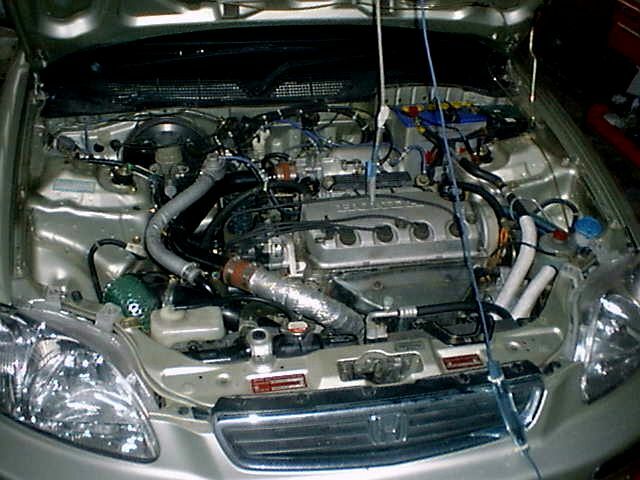 This car has been specially modified and tuned to match the specific, unique requirements of the owner who would want an automatic 1.6SOHC Civic. His or her needs would center on usability, confident performance and fuss free ownership. The custom HKS turbo-kit and the whole car's setup elevates the car up several levels of quality - power enough to equal the big displacement luxury cars with handling and safety to match, yet still retaining the friendliness and economy of ownership of a smaller c.c. car. All Honda enthusiasts can and probably will want more power from their car. The driver of an automatic 1.6SOHC Civic will be no different and will have an equally good right to want more power than those who drives Type-Rs. If you drive an automatic 1.6SOHC Honda, be it the Civic or the JDM Integra ZXis, and have frequently wished for more power, it would be worth your while to check out the HKS turbo-charged 1.6SOHC Civic at Aerotech. Call 60-3-79556112 and ask for Rennie Khoo for more details.